The DYNSTOCH network is an international network of researchers on various topics in the inference for stochastic processes. The aim is to bring major contributions to this thema using the tools of modern probability theory including stochastic calculous as well as intensive scientific computing methods. The focus is on estimation, testing and prediction methods for complex dynamic models such as e.g. diffusions, branching processes ... The problems of interest are for example in modeling and data analysis in finance, turbulence, neuroscience, telecommunication networks, hydrology, and other complex technological systems. 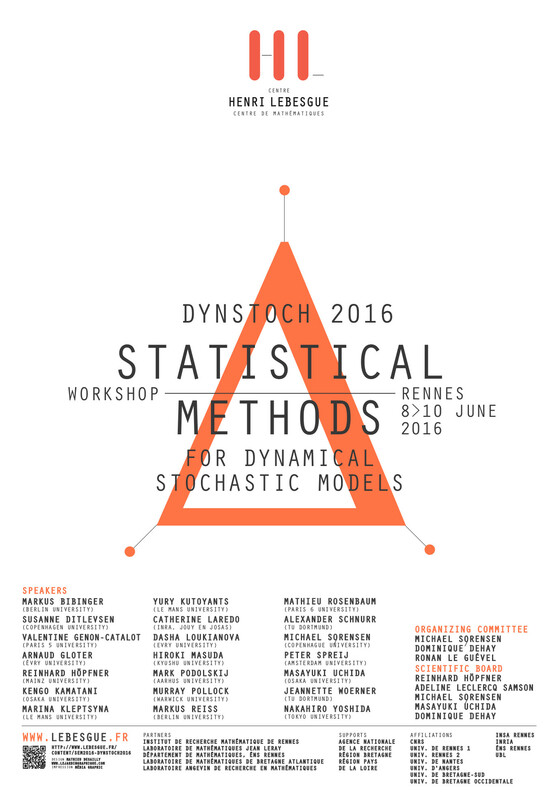 The DYNSTOCH 2016 workshop held from Wednesday, June 8th to Friday, June 10th at University Rennes 2 (Campus Villejean, Rennes, France), at the building B, in the amphi B5 Feuillerat. The slides of the talks are provided in the program page.